Thankfully, Jer came over and filmed and edited the video for me, adding in the voice-over - he's so good with all the technology --- I would have been completely lost. Thanks Jer!! The tutorial is done showing how I made the card above, but I also made a second card where the heated copper is used for the background (below). The thick copper embosses beautifully, leaving very deeply-etched grooves from the embossing folder. Edited to Add: I use copper sheets made by K&S Precision Metals (Soft Copper - 36 gauge - #6020). Click here to see the retail locations that carry their copper in the U.S.. In Canada, the copper may be purchased on-line through Cherish the Thought ... click here to view the copper in their on-line store. Beautiful cards Loll and heating the copper gives such a wonderful effect...something I need to try. A great tutorial and a beautiful card! Congratulations Loll - both these cards are absolutely beautiful and your tuts are brilliant. Wish I could get all the different colours on my copper that you do but it seems to go over so quickly!!! More practice! I am so proud of you Loll. What a huge Honor to host a tutorial on SCS. It turned out beautifully. How awesome to have Jer do the filming and editing :-) I just linked all my copper cards to your Heated Copper SCS gallery. I had no idea I had made so many...Because of YOU my talented and inspiring Friend! How fun Loll! I just love this technique - I've tried it with my heat gun - but it must not be hot enough because it doesn't do anything ~?~ now I need to ask DH if he has a little blow torch! Both of these cards are just beautiful! About all I can think of to say is WOW! Absolutely GORGEOUS cards, Loll! 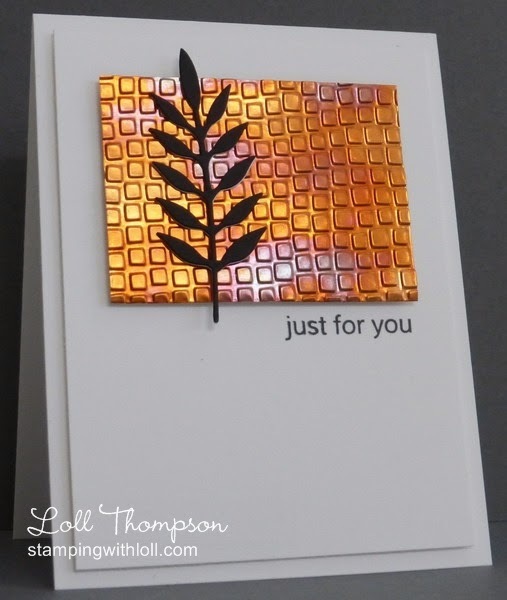 I love all the texture and dimension you've created with your copper sheets...wow! And, thank you so much for the video and step by step tutorial. too...I can't wait to get my hands on some of this fabulous medium! You know I love it when you do your 'copper cards'. They are always so very unique and beautiful, just stunning. So thanks for doing the video tutorial, I'm so glad that SCS had you do this for us. You're famous for this technique! Off to check it out. TFS the lovely cards...that texture if fabulous and would be terrific in your Mixed Media too. Hugs.